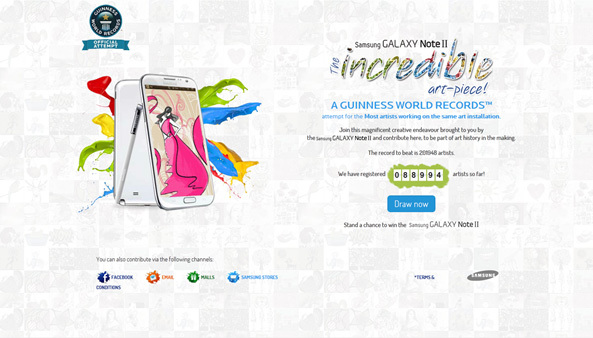 Samsung Galaxy Note II is attempting to create a new Guinness World Record for the most number of artists working on a single digital art installation, with its new campaign 'The Incredible Art-piece'. This is a unique effort in India which employs crowd sourcing to create history. Samsung is inviting user contributions across digital platforms, that have been created for the campaign, including a standalone microsite and Facebook Application. Participants can also email scanned copies of their entries or check in to a Samsung Store or malls where on-ground activations are being facilitated. The S Note application on Note II can also be used to submit entries. The promo site lays out the entries in a pixel wall format and hovering on cells shows up entries. You can click on a blank cell and create your own art piece using available stencils, clip arts and colours and give it a name. Once the artwork gets saved, you can also download a digital certificate endorsing the fact that you contributed to the Guinness World Record attempt. You can also search for your entry on the gallery. There are weekly Galaxy Note IIs to be won and 100 selected participants can also win personalised merchandise. As we have come to expect from Samsung initiatives, the creative execution is unpretentious and the design elements boast of great visual quality. It’s very easy to go overboard design-wise with such promos, but the campaigns sticks to the Samsung brand imagery and sensibilities. The promo is innovative and flows really well across platforms. hmmmm awesome! I have a 4s, but I think if apple doesn't step up their game and start think﻿ of 'new' ideas then android could easily take over the market. I might get an android next just to compare. To all apple fans that made the same mistake- It's kind of biased for you to have been an apple fan and criticize without ever trying the other product. Happy Holiday! !